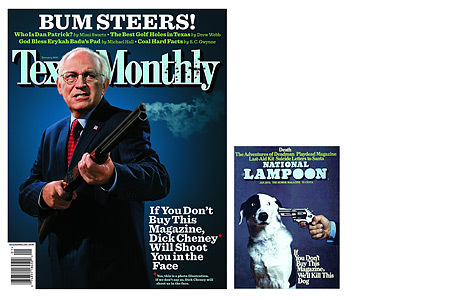 A well-timed homage to a classic magazine cover  National Lampoon's 1973 "If you don't buy this magazine, we'll kill this dog!"  it's extremely smartly executed. With so much Photoshopping going around, it has to be really convincing and seamless when you do it (while, of course, letting the reader know that it is a photo-illustration). And the styling and the photography have to be spot-on, as they are. Texas Monthly even uses the same logo color and background color as the original cover, and the updated headline seals the deal. An homage cover is a fine idea, as long as the new one advances the ball in some way. This does.